Vancouver, B.C. Canada — Sept 12, 2017 — Raincoast Trading, a First Nations-owned sustainable seafood company with 100 years of history in B.C., recently received top honors from Greenpeace Canada for adhering to the highest environmental standards of sustainable tuna fishing, beating out more than a dozen other brands in the market. The 2017 Canned Tuna Sustainability Ranking represents the fourth edition published by Greenpeace since its inaugural report in 2011 and Raincoast Trading’s third time receiving a top spot on the list. A brand with several ‘firsts’, Raincoast Trading is the first Canadian packaged retail seafood company endorsed by the respected Ocean Wise conservation program, which aims to protect and restore our world’s oceans and empower consumers to make educated choices when buying seafood. It is also the first and only brand in the country to provide consumers with a comprehensive boat to shelf traceability that includes production codes on the bottom of each can that has an expiry date and can be used to trace the origin of the fish. With this code, the company can identify the vessel, captain, name, vessel flag, harvest method, area of capture, and trip dates. In addition to strong ethical credentials, the company proudly ensures a premium North American product that is also differentiated with Bisphenol A (BPA)-free liners to seal and preserve its canned tuna. The Greenpeace report ranks brands on a number of criteria, including sustainability policy, fishing methods used, tuna species caught, traceability, labeling, support for marine conservation, fairness, ethical labor practices, and legality around unreported and underreported products. 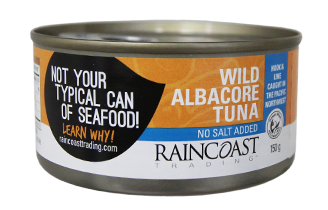 Raincoast Trading (www.raincoasttrading.com) has been selling premium, wild seafood products since 1978. Based on the west coast of Canada in Delta, B.C., the company is a subsidiary of St. Jean’s Cannery and Smokehouse, which was purchased in 2016 by the Nuu-chah-nulth Seafood Development Corporation, a group of five West Coast First Nations dedicated to growing the Raincoast Trading brand and proud to continue to offer consumers eco-friendly, gourmet canned seafood. Raincoast Trading canned seafood is available at many independent grocers across the country and national grocers including Loblaw’s, Safeway and IGA. For a full list of retailers, please visit the company online at https://raincoasttrading.com/where- to-buy/.